I. Concert Op. 8, No. 11 (F.1, No.30) RV 210, In D Voor Viool, Strijkorkest En B.c. II. Concert Op. 8, No. 12 (F.1, No.31) RV 178, In C Voor Viool, Strijkorkest En B.c. II. Concert Op. 26, No. 10 (F.3, No.9) RV 424, In b Voor Violoncello, Orkest En B.c. Made By – Sound-Products Holland B.V. 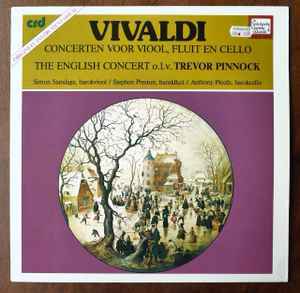 Administered by commission from the Dutch retail organisation for selling classical music. Promotional release. The sleeve notes are in English and Dutch. The English Concert on authentic / original instruments. Cover illustration: Reproduction of a painting by Avercamp; with consent from the London National Gallery. On the back cover is a list printed of the associated retail-shops.